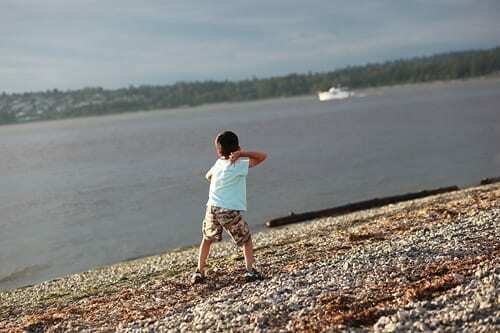 For an escape that feels hours away — but is located a mere 15 minutes from Bellingham and 50 minutes from Vancouver, BC — head to Semiahmoo Resort and Birch Bay. Spend a weekend at this laid-back, waterside location and experience total relaxation. Oh, and did I mention that it’s great for kids too? There’s just enough to do to not feel bored, but not so much that you feel like you have to hurry-hurry all weekend. 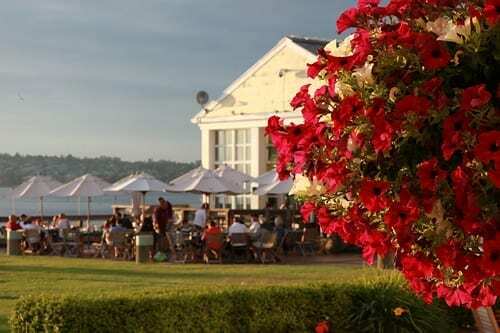 Semiahmoo Resort sits on a long spit, with picturesque views of Semiahmoo Bay and White Rock, BC. It’s great weekend getaway with kids – the resort strives to offer families plenty of fun little extras. Kids can watch movies in the movie-theater-like auditorium, swim in the indoor-outdoor pool (although it may get a little chilly in winter, it’s heated to 80F year-round), relax in the hot tub, or complete the scavenger hunt and pick a little toy from the treasure box after completing the on-site scavenger hunt. Front desk staff can lend buckets and shovels, and you’re just steps from the pebbly beach. The resort’s Seaview Room looks out onto Semiahmoo Bay. 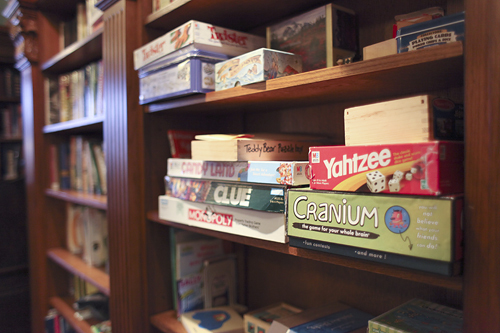 Pick out a board game from the resort’s collection (Candyland, Chutes and Ladders, Monopoly Junior, Sorry, Connect Four) or bring your own. In the library, a roaring fire burns in winter (or you can ask the staff to start one for you). Pick up a hot chocolate for the kids at the resort’s gift shop/coffee bar, and a hot toddy for the grown-ups at Packers Lounge. This resort is upscale enough to host weddings, but low-key enough for families to feel comfortable. Often, resort food is known for poor quality and overpriced totals, so I was pleasantly surprised by Packers. Our meals were generously sized, very good and reasonably priced. A variety of hotel rooms are available, but I recommend the The Deluxe Waterview Rooms, which open up to the outside grassy area via a door. The rooms aren’t super-swank and feel more like homey hotel rooms, with knotty pine built-ins. It’s not an exclusive resort, so there’s no need to pack anything but jeans and a sweatshirt. Rates range all over the place, but rooms are frequently available for under $100 in the off-season, with deals for multiple nights and midweek stays. In summer (June 18-September 6), ride the cute-as-a-clover Plover Ferry between Semiahmoo and Blaine’s dock. This ferry ride was a hit with the kids, as it putters through the harbor past fishing boats and barking seals. Blaine, the last stop in Washington before the U.S.-Canadian border, doesn’t have a whole lot to offer – but the town’s main street holds a decent Mexican restaurant and a few little shops. So I recommend heading south for 15 minutes to Birch Bay, a quaint saltwater community where families have vacationed for generations. Birch Bay itself is rumored to be the warmest spot on the Pacific, north of California, and it’s easy to see why — the land shelters the estuary in a gentle c-shape. You’ll see families crabbing in the calm waters and combing the tidepools for treasures, including hermit crabs, seastars and sea urchins. 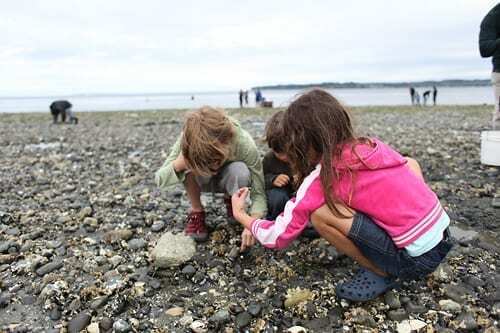 The 194-acre Birch Bay State Park is open year-round for camping and tidepooling. Not loving the crab? In summer, Birch Bay Waterslides offer six low-key slides for families to slip down. During weekends (weather permitting), families drive go-karts and play mini-golf at Miniature World. And they always bring bikes, it seems. 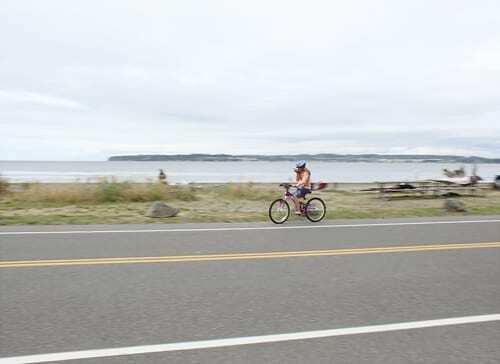 I frequently see dozens rolling along calm Birch Bay Drive. Year-round, pick up chocolate, candy and other perfect sweets in the vintage-styled The C Shop. The Bay Café slings sandwiches, chips and other straightforward fare. 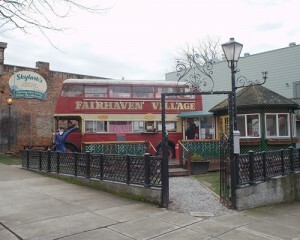 Other local attractions include the windmillish town of Lynden (modeled on a Dutch village) and the shopping and movies and kid-friendly fun in Bellingham. But once you arrive in Birch Bay or Semiahmoo, I doubt you’ll want to leave. It just has that sort of effect on a family. 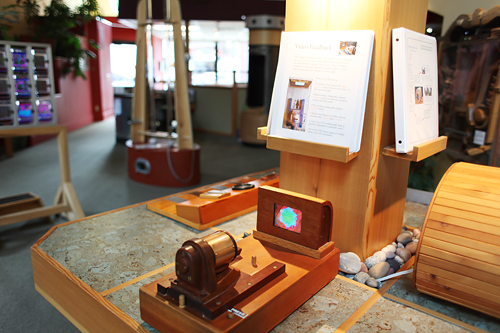 This weekend I had the chance to stop by the Fairhaven Toy Garden in Bellingham, Washington. 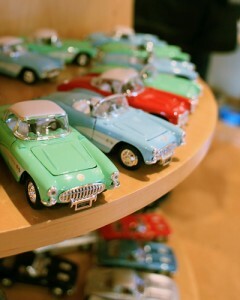 This 1,900-square foot shop encourages families to play with puppets, pick costumes and test out a toy car’s wheels. 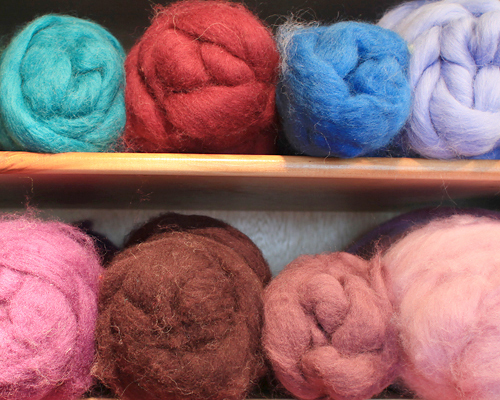 Anyone over age 10 can try their hand at needle-felting pocket-sized rabbits and sheep at the store’s Saturday workshops. Shelves of yarn and art supplies keep creative kids happy. A window-side table encourages families to sit and color with wax crayons and Lyra pencils. The Toy Garden’s Waldorf-inspired owners supply wooden building toys, colorful roving, moldable beeswax and other natural playthings. It’s a sweet little shop, and it’s within sightline of the Fairhaven Village Inn, which you might win a free night’s stay at with my Midweek Getaway Giveaway. Even if you don’t win, you might drive to Fairhaven for a felting workshop. 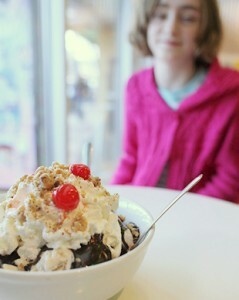 As one of the store’s owners told me: “Mostly adults show up!” But it would be a fun late-morning jaunt with your tween. After the toy store, play tag in the village green, near the store, or explore the rest of Fairhaven with your child. It’s a relaxing way to spend the day. I love looking at this photo on grey Northwest days. It reminds me that summer — my favorite time of year — is just around the corner. Summer means bike and boat season, endless daylight hours and sunsets that drip with color (instead of noses that drip with…well, you know). Find more inspirational photos at Delicious Baby. Recently, we went on a short jaunt to Bellingham, Wash., about 30 minutes south of the U.S.-Canadian border, and two hours north of Seattle. It’s a cute little college town with a thriving arts scene and fabulous food. Turn-of-the-century architecture lines downtown Bellingham’s streets, and the town is home to Washington’s oldest brick building (built in 1858). The Whatcom Museum’s new Family Interactive Gallery took us all by surprise. It’s amazing what they’ve done in such a small space. 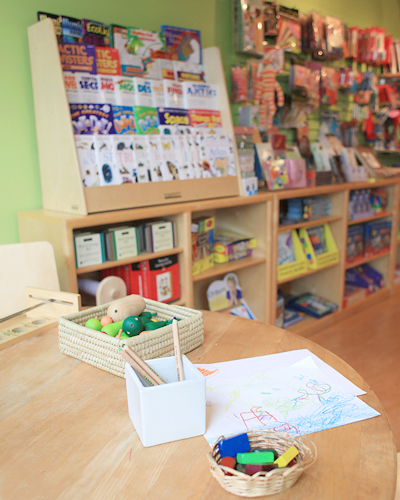 Kids can craft in the art room, build with enormous Tinkertoy-like foam toys, or play camp (like with tents, not with sequins) in a Northwest-themed area. We created a soundscape with authentic Cascadia noises (orcas, owls and of course, rain). I liked how real art was mixed into each exhibit space, along with questions to provoke discussion. The gallery is ensconced in smooth, touchable wooden fixtures and forms; all of it is handcrafted from sustainable wood, by a local woodworking shop. Noon. Super Mario’s. Most kids love Mexican food, all smothered in cheese and whatnot. But how about El Salvadoran food? What if the restaurant was named Super Mario’s? (3008 NW Ave., 360-393-4637). With such an awesome name, you can’t go wrong. Right? No one was in the small dining spot (thereby violating travel rule #1: Never eat in an empty restaurant). Super Mario’s was a jarring combo of high-end and low-end, and I feared for the worst. It was inside a stripmall, with granite-style tables and marble floors, with two dueling televisions playing on each end of the rectangular room. But Super Marios served a fantastic south-of-the-border meal – we had pupusas (tip: add the green sauce for a stellar experience), we had creamy tamales, we had quesadillas that rocked so hard that even my veggie-hating kids ate them in a hurry and pleaded with us to quit stealing bites. AND they play Nickelodeon on one of the TVs, at least on the day we were there. Can’t beat that. By the time we left at 1 p.m., (pink sugary cookies in hand), the restaurant was full. 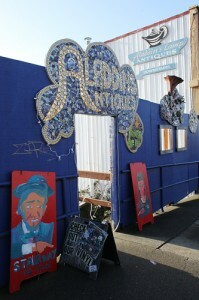 1 p.m. Aladdin’s Antiques. Half history lesson, half shopping experience, Aladdin’s Antiques (427 W Holly St.; 360-647-0066) offers cute figurines, Star Wars goodies (we found a retro 1981 activity book my son now carries everywhere) and great vintage finds for your kid’s room. My kids have found enough treasures at antique malls to be interested; yours may need some convincing. If your kids are definitely NOT into in oldy-worldy goodies, you can send them (with your partner) to Mindport. They’ll love it, promise. 2 p.m. Mallard Ice Cream. About a 10-minute stroll from Mindport, Mallard is the ice cream shop a child would design, if only we parents would let them. Bright-red barstools, vivid green couches, and out-of-this world flavors that seem like they were hand-mixed by a creative 4-year-old foodie – black sesame vanilla, cardamom, rose, butter pecan and over 20 more. We all wanted to try multiple flavors, so we bought a bowl with four scoops, topped with chocolate and whipped cream. After the kids polished off the bowl, they played a sticky-fingered game of Connect Four. 3 p.m. Walk Fairhaven. Fairhaven is a steep-sloped Bellingham neighborhood. It’s crowded with artisans’ galleries, kids’ toy shops, a cupcake shop, a great gelateria (Sirena) and cool little indie bookstores, all within about six city blocks. An itty-bitty San Francisco, as it were. A former rough-and-tumble waterfront town in the 1800s, Fairhaven has now been gentrified. You won’t need to fear the likes of “Dirty Dan,” described as an “infrequent bather” (sound like anyone in your home?). He was also worked as a rum-runner, war-inciter and in other jobs not outlined on Career Day. 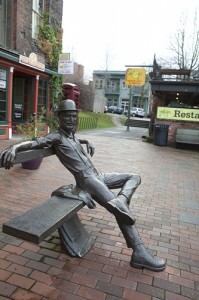 However, you will see bronze statues memorializing Dan and placards describing the town’s bad history. Kids love that stuff. Fairhaven is well-situated for Seattle and Vancouver families – the railway station drops you about a quarter-mile from all of the action. Victoria families can take the Victoria-San Juan Cruises over to Fairhaven, starting in late spring. Summer may be the best time to visit – you can take advantage of the Fairhaven Outdoor Movies (see the past year’s showings here). 5 p.m. Marine Park. Walk 10 minutes from Fairhaven’s core toward the water, past the Amtrak station and the large ferries destined for Alaska daily (as part of the Alaskan Marine Highway System) and toward Marine Park. 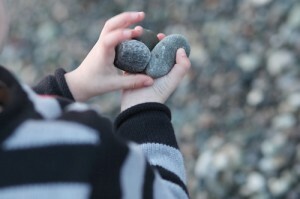 Flat, smooth stones (perfect for skipping) populate the Marine Park’s shoreline. I recommend arriving about 10 minutes before sundown. Bring your camera! Here, it’s like the sun can only set in some sort of Kodak moment, behind the San Juan Islands and the Olympic Mountain Range. 6 p.m. Boundary Bay Brewery. We drove back out of Fairhaven for dinner. While Fairhaven has plenty of restaurants, we’d heard raves about Boundary Bay Brewery, and we weren’t disappointed. If you forgot to make a reservation, kids can pick through the Duplo block basket in the waiting area. But note: Make a reservation! Although this brewpub offers large rooms and lots of seating, it’s incredibly popular with college kids, families and singles. Smart sandwiches on Great Harvest bread, creamy salmon chowder, micro-brewery beer, the whole authentic Cascadia mix. Overnight. At this point, we could’ve gone home, but we decided to spend the night in Fairhaven to soak up the atmosphere. We stayed at the 22-room Fairhaven Village Inn, which has special winter rates and a fun library room with games. The room’s gas fireplace made the room toasty on a winter night, and the next morning, my kids gobbled their free continental breakfast. They ate cereals, bananas, muffins, made-to-order waffles, eggs and yogurts. Yes, each child ate all of those things. When you figure the cost of feeding four people in my family, a breakfast-inclusive stay is always a money-saver. 8 a.m. Harris Avenue Restaurant: However, if you decide to sleep elsewhere, I recommend going for breakfast at Fairhaven’s Harris Avenue Restaurant (1101 Harris Ave.; 360-738-0802), where we’ve eaten on our way back from Vancouver, BC. You’ll find hearty breakfasts, plus fruit face pancakes for the kids. Huge, huge lines. 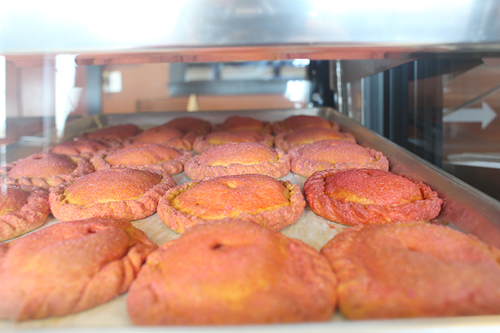 Get here early for your cornmeal pancakes. Harris Avenue Cafe at noonish, after the lunch rush dies down. This summer, we hope to return — maybe take the Amtrak up for a family day trip, or bring the car for a weekend. We want to cruise the well-regarded Chuckanut Drive, forebodingly called Upchuckanut Drive by some locals. My youngest is an upchucker. We’ll need to be well-prepared. 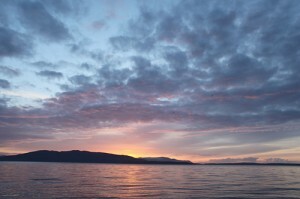 To discover more about Bellingham, check in with Bellingham Whatcom County Tourism. 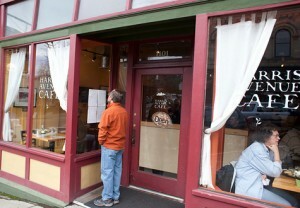 What did we miss in Bellingham? Do you have any tips for the prevention of road nausea? Art galleries don’t usually welcome children with open arms. Or ask you to touch the art. But Mindport, in Bellingham, Wash., is a different sort of gallery. The wooden works inside are meant to be used by hands big and small. It’s an artistic explosion of science, music and movement. 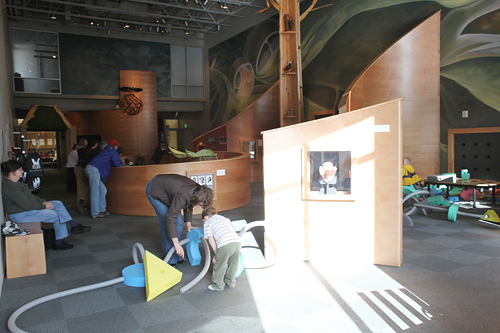 Rube Goldberg would love this gallery-museum-playspace. 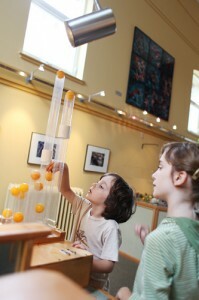 The light-filled entry gallery offers multiple workstations with awesomely odd contraptions, including a pneumatic ping-pong device that spins balls using forced air; a pun-riddled miniature train route; and a case with a hundred compasses — all controlled by the magnet in your child’s hand. The second gallery has subdued lighting and natural items to explore — shells, bones — along with a music corner featuring a few guitars and light-and-sound invention that’ll have the kids dancing. The gallery isn’t just for kids, and parents are expected to keep a watchful eye to ensure a child’s gentle hands. But the creators-owners encourage, explain and enthuse over visitors of all ages. After a short time, Mindport’s mellow calm will seep into your soul, and perhaps inspire an invention or two at home. Best for: Children of all ages; not a place to go with cranky kids right before dinner or at naptime. Mindport is located at 210 West Holly, in Bellingham, Wash. Hours are Wednesday through Friday noon-6 p.m., Saturday 10 a.m.-5 p.m., Sunday noon-4 p.m. It’s closed every Monday and Tuesday. Admission is $2. No Hotel Rooms? No Problem.